A few springs ago, my wife and I raised beds for a vegetable garden. We built the beds with lumber and brackets from the hardware store and planted tomatoes, cucumbers and herbs. But we cheaped out. Honestly, I cheaped out. I bought off-brand soil and chose not dig the beds very deep. You know where this going, right? The tomatoes yielded mixed results in the first year. We never a single saw a cucumber. Our only redeeming feature was the mint, which is the only thing still growing. The national mood reminds me of the plants I had expected in my abandoned raised beds. 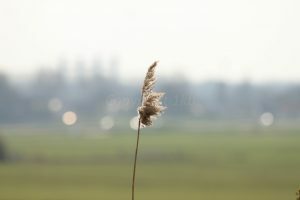 The soil is shallow and the fertilizer isn’t good, so not much good is growing but weeds. Recent polling indicates that 57% percent of Americans have anxiety about this political moment. Many adults I know, college educated folks, people who own their own homes, folks who have $120k+ household incomes, people with multiple post-graduate degrees--people with deep, rich soil--are anxious. 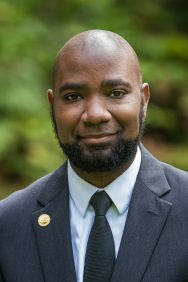 From firsthand experience, I can attest that the percentages are far higher among our most vulnerable populations: low-income students, students of color in low-income schools, transgender students, undocumented students, and students from a mixed-status family (some members of their family are documented, usually the children, while other relatives, often guardians, aren’t). It’s disheartening to listen to the observations of my senior students. 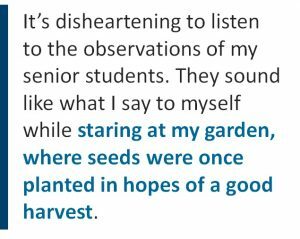 They sound like what I say to myself while staring at my garden, where seeds were once planted in hopes of a good harvest. They expected good things as political figures proposed ideas that would benefit them: free college; safety in locker rooms and restrooms, expansion of DACA and a path to citizenship. Now, like my hopes for cucumber, that’s all gone. Instead, they see proposed cuts to Pell Grants and other programs that make college affordable. Federal guidelines protecting transgender students have been removed. The online FAFSA application to apply for student aid was taken down (temporarily). Our students are witnessing more aggressive immigration enforcement and raids in places they have never seen before. Instead of having their soil deepened and enriched, they face more exposure to the elements. What is happening to them is far worse than what I did to my pitiful garden. These challenges to the humanity of our students pose an existential threat. This isn’t about who anyone voted for in November. It doesn’t really doesn’t matter if you love or loathe the President of the United States. This is bigger than politics. This is about the moral obligation that we as professional educators have to all of our students, but especially those who are most vulnerable. It’s hard to focus on first period calculus or fourth hour biology when you’re worried if your uncle will come home from work or if you’re terrified because you can’t use the bathroom of your gender expression. Their ability to learn and thrive in our classrooms is eroded, washed away by this uncertainty. Last week the President’s budget director Mick Mulvaney said that there is no evidence providing students with free meals or afterschool programs helps them to learn. Clearly he has not spent much time in a classroom. 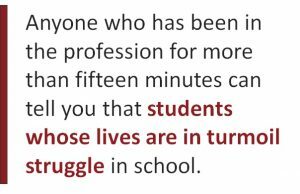 Anyone who has been in the profession for more than fifteen minutes can tell you that students whose lives are in turmoil struggle in school. I have had the “What’s going on at home, buddy?” conversation hundreds of times over my eleven-year career. Now for millions of our students the turmoil isn’t coming from home, but blasted on the news daily. Our students deserve better. We must make intentional efforts to affirm their humanity and value in our classrooms. We must reject the use of othering language in our classroom discourse. 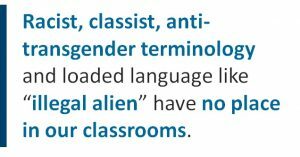 Racist, classist, anti-transgender terminology and loaded language like “illegal alien” have no place in our classrooms. We must publicly affirm our support for our marginalized students in matters that threaten their well-being and reject calls for “neutrality”; our silence on issues impacting our students speak volumes to them. We must be willing to risk some of our own social capital and advocate for our students, even if doing may not be popular. If you’re not willing to do this tough work for them, don’t be shocked when your students aren’t willing to work for you. As Rita Pierson said in her legendary TED Talk, students learn from people they love and can thrive when they feel safe in our schools. We owe them that. They are all our students, all of them.